We leave at our usual ungodly hour of 5 a.m. and are at the Wright trailhead leading to Goose Eye Mountain at 9:15. The trail, decorated with wildflowers, lined with gorgeous green moss and ferns, bounded by the brook and capped by blue skies, welcomes our hiking boots and it is impossible not to be happy. We follow the Goose Eye Brook much of the way, dazzled by pools, cascades and waterfalls. I'm taking pictures one after the other, knowing the memories are almost as good as the hike itself. It is a gentle up and Pat and I have been spinning and running, so we are good to go. But it is HOT! Sweat happens. About 2 hours into the hike, I look up and see Goose Eye Mountain right in front of me. What? Are you kidding me? Haven't we been climbing Goose Eye? It looks as if we haven't even started the up! I remind myself that it always looks worse than it is and I keep walking and sweating. The trail is wet and muddy in spots -- the thick, sucking kind of mud that wants to eat your boots if you are not careful. There are spots where the wooden walkways over marshes and muddy areas are worn or broken and its actually easier sticking with the mud. Goose Eye is a cirque and the trail takes us right into the middle of it, so we are totally surrounded by Goose Eye Mountain. Very cool trail. From here we know there is only one way to the summit -- straight up. And up we go. We come out on a rockslide and my heart skips a beat - it looks mighty steep. But the trail takes a right and manages a few switchbacks rather than going straight up the slide. Thank you. Mica sparkles on the trail and we are picking up flakes to add to our mica collection from all the mountains we've climbed so far. Soon we hit ladders and steps that take us up the steepest pitches of the trail, and then we run into a boardwalk that leads the way up the final stretches to the summit of East Goose Eye. Much of the time that I am on the ladders and the boardwalk, I am marveling at the fact that I am walking on something man-made, 3,000 feet up in the middle of nowhere! 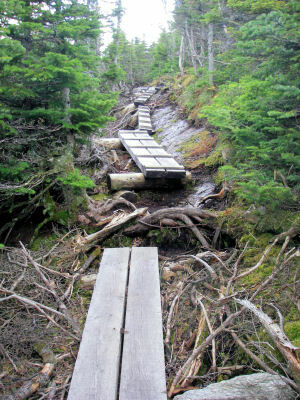 From the internet I discovered the Wright Trail was constructed by the state of Maine in the 1990s. I often take for granted what is under my feet. I forget that it took lots of people months, muscles, money and mental muster to make this trail for me - from the idea, to the plan, the mapping and design, and hard physical labor. I get the joy of being able to put one foot in front of the other without tripping (most of the time), and without getting lost (most of the time), leaving me at peace to enjoy all that is around me. As I walk, I am internally thanking all the trail workers who put the boardwalk there to ease my passage. Actually to make my passage possible. How often do we remember that there is always someone who has gone before us, and by going before us, has eased our way through the process, the life event, the transition, the moment, the difficult time, the journey, or over the trail. Trail work must be grueling. I have a hard enough time working in the tiny landscaped area in front of my house. Trailwork is heavy, physical labor in the sun. Much of it done by volunteers. So I say to all the people who make the trails passable -- thank you for the ladders, for the boardwalks, for the little bridges over the moist areas. Thank you for the trails, the trail signs, and for finding the beautiful way. Thank you for the blazes, for the cairns, for the mountain lists. 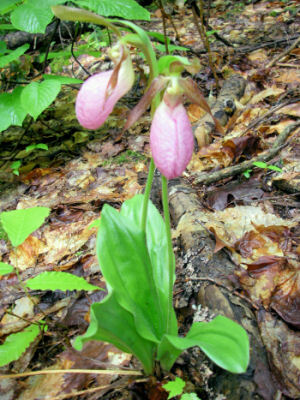 I am the lucky one - I get to enjoy the beauty of the natural world because the trail has been blazed for me. I love that! The trail has been blazed for me...what a gift! Once Pat and I are up there, on the bald peak, enjoying the spectacular views, breathing getting back to normal, sweat beginning to wick in the wind, I see another peak next to this one, also with a rocky bald summit. "I'm not going over there," I say to Pat. But I already know in my heart that I am. It looks higher than where we are, so I am sure that is the Goose Eye peak that counts. But, it's 1:20 so we put off the inevitable and find some flat rocks out of the wind and enjoy our lunch. I lie down on the warm rocks, head on my backpack. I am soooo comfortable. Pat is walking around doing something. I close my eyes. "Com'on Pat, lie down," I say as I slap the rock beside me. I move over and make room for her to share my backpack pillow. She realizes I am going nowhere, so she joins me, and I find myself staring at the clouds, trying to make out the shapes. I'm loving the moment. Pat eventually stands up and that is my signal. I reluctantly get up, grunting, put my backpack on and together we head off to West Goose Eye. It looks like it is going to be a steep down and an even steeper up, but it's not. A half a mile later we are on the summit of Goose Eye -- # 71 of the 100 highest. Check it off baby! 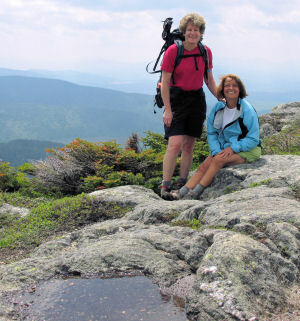 We high-five, take a few summit pictures and head back down the way we came to the North Fork of the Wright trail. We are on a beautiful ridge that goes over a series of bald knobs, with great views. Pat and I are loving the trail. It is exceptionally beautiful. I love the cairns, I love the views, the bare rock, the flowers, the bright green, the mica, Pat's companionship, it's all awesome. It's moments like this that I revel in all that has happened for me over the past two years. Me, a hiker, a writer, an extremely grateful human being. You know, perhaps we all blaze trails in our lives that ease another's passage. Maybe it is through our work. Maybe it is through volunteering. Maybe it is just something we say to someone, or a smile, a thanks. Maybe we never know the passage we are clearing for the next person or the impact we have on others. In Bed Bath and Beyond a few weeks ago, I was buying a gift for my daughter's bridal shower. A woman standing behind me in line, slipped me a 10% off coupon as the clerk rang up my purchase, unexpectedly easing the price, making it a bargain! I was in an airport a few months ago, waiting for a flight home from Florida, talking to my husband on the cell phone. He told me our 12-year-old golden retriever, Rajah, was just barely clinging to life, and hopefully would hold on until I got home. Tears spilled down my face. A woman sitting a few chairs away leaned over and placed a few tissues in my lap. Kindness always eases our journey. I took a spin class, my first time in this gym. Pat set up my bike, Elise showed me how the resistance worked, Laura smiled and welcomed me to class, and the instructor, Sarah, explained how the class worked. They gave me reassuring smiles, showed me the various positions on the bike, we talked about sweat and ways we could get out of class if we feel like we are dying. It all eased my passage into spin. And then there are the less personal easings that have helped us live our lives more comfortably with more joy and meaning...cars and roads, electricity and plastic, voting, wicking hiking clothes, sports bras, whoopee pies, maple syrup, chocolate-dipped pretzels and the TV shows LOST, 24 and So You Think You Can Dance, and trails with boardwalks, ladders, cairns and blazes. They are gifts. We all offer easement in our own way. And it comes from the heart - perhaps that is why it feels so good. Pat and I make it back to the car at 6:15 and enjoy cold Snapple and Pepsi before the long ride home. It is a four-hour drive but it feels like nothing. We have a blast reminiscing about our hikes over the past 2 years - 69 hikes, 96 successfully climbed mountains, 10 attempts, 623 miles -- all in 2 years and 1 month. Wowsers! But the stats are nowhere near as meaningful as the laughter, the fear, the learnings, and the best part...the moments we have helped ease each other's way up and over every one of those mountains. We leave the world a bit better, in our own ways...and when I take the time to let each small gift in, each trail, every smile, all the kind words, I am overwhelmed with gratitude.